The Upper Colorado River Basin (UCRB) Climate Effects Network (CEN) is a science team established to provide information to assist land managers in future decision making processes by providing a better understanding of how future climate change, land use, invasive species, altered fire cycles, human systems, and the interactions among these factors will affect ecosystems and the services they provide to human communities. The goals of this group are to (1) identify science needs and provide tools to assist land managers in addressing these needs, (2) provide a Web site where users can access information pertinent to this region, and (3) provide managers technical assistance when needed. Answers to the team’s working science questions are intended to address how interactions among climate change, land use, and management practices may affect key aspects of water availability, ecosystem changes, and societal needs within the UCRB. 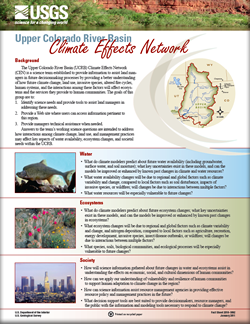 Belnap, Jayne, and Campbell, D.H., 2011, Upper Colorado River Basin Climate Effects Network: U.S. Geological Survey Fact Sheet 2010–3092, 2 p.